We did a lot of looking around and finally settled on a shipping company that sold their excess inventory direct to private parties. Delivery was about five hundred dollars and it took a few weeks for the size, shape, and color of container that we wanted to become available. When you order one, you need to specify whether the cargo doors are to be oriented toward the front or the back of the truck. 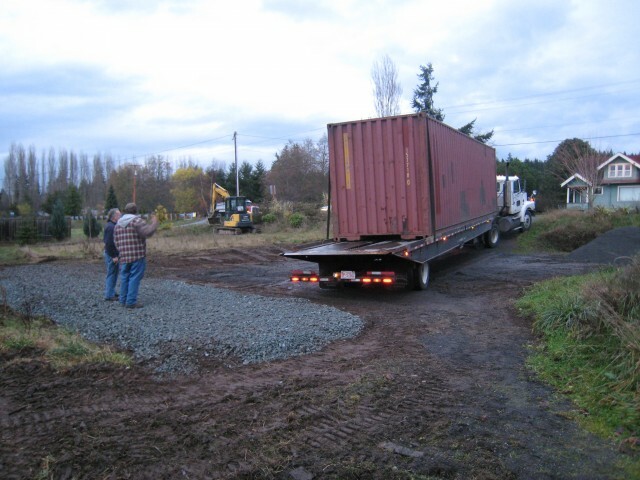 Once the truck arrives, the container will be oriented whichever way it is unloaded. It unloads like a dump truck, with the whole bed tilting up so that the container slides off the rear. We positioned one end where we wanted it and then used an excavator to rotate the other end into its final location. Even though containers are fabricated from Cor-Ten steel, they are still prone to decay if left sitting on the ground. For our purposes, we installed a thick layer of ballast rock (about 6″ above grade) to limit the containers contact with surface moisture. We followed up with concrete piers to positively tie the structure down (earthquake insurance).